Locking bottom drawer keeps sensitive documents secured. The 28 inch high file displays a warm Light Oak finish accented with polished metal hardware. A locking bottom drawer helps keep your person information safe and secure. 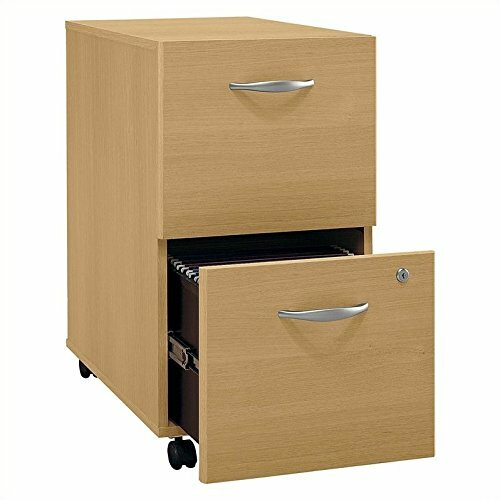 Dual casters make this file cabinet easy to move wherever you need it. This mobile cabinet can fit almost anywhere it is needed, whether under desks or in office corners. Casters allow easy mobility. File fits under desks. Made in United States. Each drawer holds letter, legal and A4-size files. One gang lock secures both drawers. Drawers open on full-extension ball bearing slides. Ships ready for easy assembly. 15.709 in. W x 20.276 in. D x 28.110 in. H.